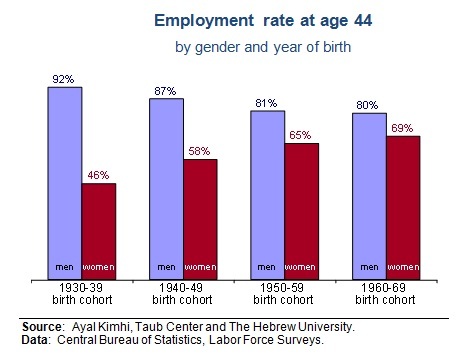 The employment behavior of Israeli men and women born in different decades has changed from each generation to the next – with differences in education levels the key divider between groups. 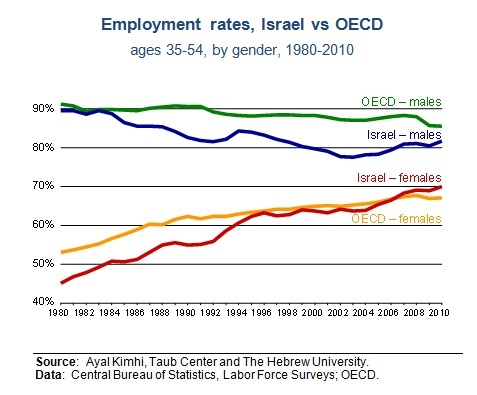 A major source of concern regarding the Israeli economy is that the rate of employment among Israeli males has declined markedly over the last three decades, and is considerably lower than in OECD countries. The female employment rate, on the other hand, has been rising continuously and is now higher than the OECD average (see first figure). At the recent Sderot Conference for Society, Taub Center Deputy Director Professor Ayal Kimhi presented new evidence on the labor market changes underlying these trends. One finding was that the changes are mainly due to changes between generations, rather than changes within them. Kimhi’s study shows that the employment rates of each new generation of males are lower than those of the previous generation. By contrast, each new generation of females tends to have higher employment rates than the previous generation, as shown in the figure. Another finding demonstrates the relationship between employment and education. Since men and women have much different labor force characteristics, the education gap has different effects on men and women. Nevertheless, within each group the impact of education is pronounced. It turns out that the decline in Israel’s male employment rate over the past decades was primarily among relatively older men with low education. For example, among men born in the 1940’s, there is no observable relationship between employment rates and schooling until their late 30’s. Starting at around age 40, employment rates of men with 12 or less years of schooling decline continuously, while employment rates of men with more than 12 years of schooling start declining only at age 50 (figure). By contrast, Kimhi finds that the rise in the female employment rate is almost entirely attributable to the increased acquisition of higher education; the employment rate of women with over 12 years of schooling is nearly double that of women with up to 12 years of schooling. Employment rates among women with 12 or less years of schooling increase until age 43, then remain stable until they begin to decline at age 48. On the other hand, women with more than 12 years of schooling exhibit continuously rising employment rates through age 49 and only then does the decline begin. 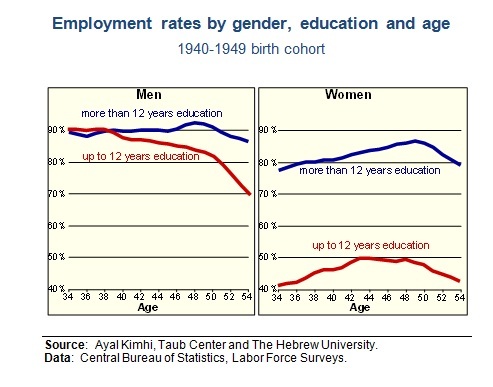 Thus, as Kimhi explains, the substantial rise in employment rates in Israel is almost entirely attributable to the rise in female higher education whereas among men, employment rates tend to decline among younger generations in general and among the less educated men in particular.